In general, adding support for a new remote control is accomplished by pressing each button and capturing a key code sent by the remote. Once the key code captured for each key, they are organized into a map that is used to configure LinuxMCE. There are a variety of different infrared (IR) receivers that work with LinuxMCE. Infrared receivers are small pieces of hardware that have an infrared-sensitive "eye" and plug into a computer. Some examples of LinuxMCE compatible IR receivers are USB UIRT, Tira, and IRTrans. For some IR receivers, the best support is via LIRC, while for others, purpose-built LinuxMCE drivers are available. The key code that is captured when a button is pressed depends on both the remote control model and the receiver model. That is, the key codes that you capture from a Windows MCE Remote with USB UIRT are different from those captured from the same remote with Tira or IRTrans. The technique in this section was originally provided in this forum post. 1. Verify USB UIRT is installed and configured: Once you plug in the USB UIRT it should be plug and play and add both the USB UIRT device as well as the Windows XP MCE Remote (USBUIRT). Go to Wizard->devices->media directors. Near the bottom of the page you should see the MCE remote listed, with the Infrared Receivers pulldown set to USB UIRT 0038. 2. Create a new template for your remote: Go to Advanced->Configuration->Device Templates. Select the remote's manufacturer and USB-UIRT Remote Controls < Remote Controls < Peripherals from Device Category then click Add Device Template. This will open the Add device template window. Enter the name or model # of the remote followed by (USBUIRT) into the text box and click Add. Try to be descriptive and unambiguous if you don't have a model number. For example, a good name for the remote that comes bundled with the Hauppauge PVR-150 is PVR-150 remote (USBUIRT). The number of characters allowed is limited, so you'll have to use your judgment to come up with a good name. 3. Configure the remote correctly: Go to Advanced->Configuration->Device Templates, find the remote you just added (you may have to refresh your browser to see it), and click the Pick Template button. This brings up the Edit Device Template window. Change the Device Category to Peripherals - Remote Controls - USB-UIRT Remote Controls. Select the correct manufacturer for your remote. 4. Get the USB UIRT device ID: From the bottom of the left pane on the Admin Page, click Show devices tree. In the tree, click USB UIRT 0038. Find the device number in the title of the Device Info block. For example, Device Info #50 indicates that the USB UIRT is device #50. The numbers 1500003E3CFC and 1700009E0FC0 are the key codes for that button. If the two numbers are the same, then there is only one key code for that button. In a text editor, format the button names and key codes in the same format as this. 6. 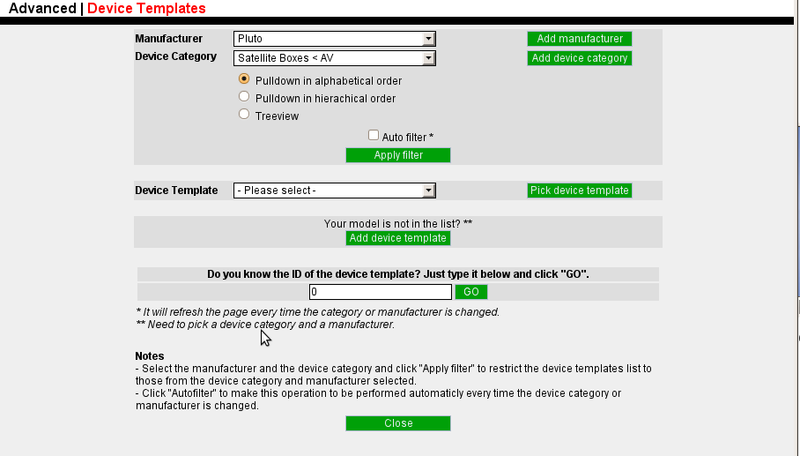 Add the Configuration (string): In the Device Data box select Configuration. Paste the key codes you created in the last step into the Default Value field. Click the Use Master Device List Defaults box. 7. Add the Remote Layout (String): In the Device Data box, add the new parameter Remote Layout (String). In the Default Value field enter W.
8. Click Save then Close to close the Edit Device Template window. 9. Add the remote: Go to Wizard->devices->Media Directors and scroll to the media director that you want to control with the remote. Click Add Remote then select the remote template you just created from the Device Template drop-down. Click Pick Template and then back on the Media Director page, click Update. After this you should be prompted to reload the router, if not do a quick reload. WARNING: Make sure your device template is created under CORE in the device tree. If it is created under "The core/hybrid", delete this device and create it manually. Once the router reloads, you should have a working remote. It is helpful to share your key codes with others. See Share IR Codes for details. LinuxMCE's infrared remote control module is based on LIRC. See http://lirc.org/ for details. LIRC includes an 'IR Record' utility to build a configuration file for a new remote control. Once you do that, then in LinuxMCE Admin choose 'Advanced', 'Device Templates'. Choose the manufacturer, for the Category choose Peripherals, Remote Controls, LIRC Remote controls. Type in the model of the remote and click 'add'. Then edit the device, add a device data "Configuration" and copy the LIRC configuration file into it. The Programming Guide in Control LinuxMCE using an Infrared remote explains how it all works, and also how to use it. Adding iMON PAD explains how to add it to the LinnuxMCE. This page was last modified on 29 March 2014, at 16:30.